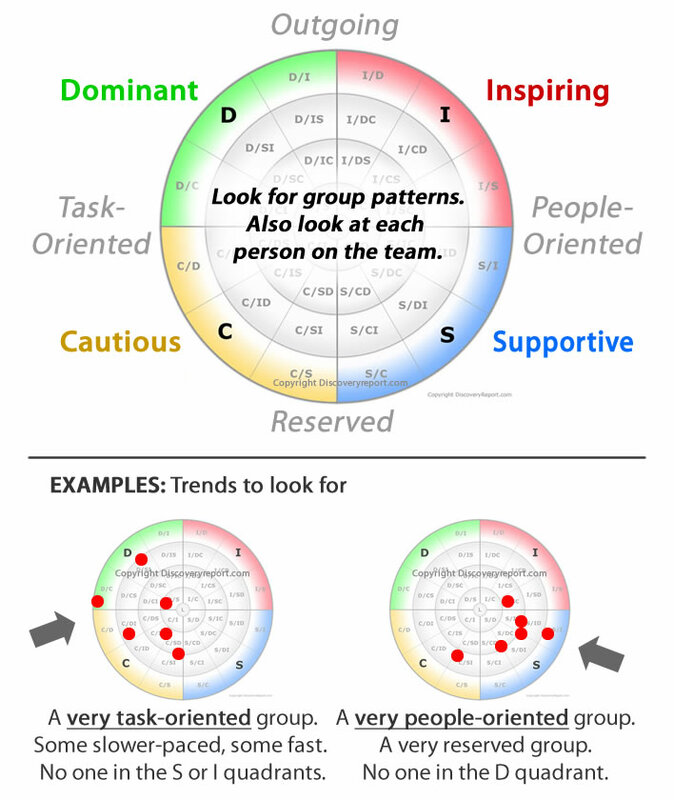 View the DISC Personality Style of Your Whole Team Using Team Charts! Use this powerful free tool see everyone on one chart to get an at-a-glance view of everyone's DISC personality style. You can even click on individuals on the graph to view summary information for that person. Team charts are useful for looking at team interaction dynamics, seeing a group's personality as a whole, identifying tendencies of the group, and visualizing how individual team members fit in with the group in general. You will need valid Discovery Report access code for each person to be included on the chart. You can get more access codes in our online store . Fill in the information below and click on the "View Team Chart" button. This will be printed at the top of your Team Chart Examples: "The Sales Team" or "Training Class"
Spread out the plotting points? Yes Leave this box checked to spread out the plotting points to minimize overlap. Uncheck for more exact plotting results (may result in more overlap). Include descriptive DISC words on chart? 1. Keep in mind that the results of the personality tests can be further explored for each person by clicking on their plotting point on the graph. 2. Keep in mind the major divisions of the chart ... Outgoing vs. Reserved and Task-oriented vs. People-oriented. Look for whether the group is weighted towards one side or the other. That can indicate the flavor of the organization. 3. Keep in mind that everyone is a blend of all 4 personality styles. This graph is not meant to "pin" anyone down. The graph is intended to be one view of the group. Use this as a tool - as a way to envision an organizational snapshot. 4. Be aware that charts with a large number of codes (50+) may occasionally not plot effectively if the server is overloaded. If you have trouble, you may need to try again later. If you experience technical difficulty, then please contact our support team. Another Free Bonus ... The Relationship Feedback Report! The Relationship Feedback Report is a FREE report for any two people who have Discovery Reports. It will give you 11 pages of terrific information to help you improve the way you understand and relate to one another. We have a variety of reports depending on what you need. You can visit our online store or find out which version is best for you using our selection chart. Have you considered DISC Certification Training? Personality Insights offers the best DISC training available anywhere - including advanced level and master trainer certification. Click here to learn more about our DISC Certification Training programs. Note: We also have DISC profile versions for teens and children. Discovery Reports can help you connect better with everyone that you are around! All they need is a Discovery Report, and you can use Team Charts, Relationship Feedback Reports and more.